You can purchase the 25 pages of activities in Kids' Wings paired units: 10 pages of activities for fictional Meerkat Mail , PLUS 15 pages for the nonfiction Meerkats NOW! Available for immediate download for only $15.95! Sharable within your school! Click Here to purchase and download from Teachers Pay Teachers! Next, Sonny goes to stay with his cousins Scratch and Mitch who live in a termite mound. From there he writes another post card before the itching gets to ticklish for him and he moves to cousin Edward's home on the farm. You can follow Sunny's quest for the perfect home through his emails that are included in his book: Meerkat Mail. Can you guess where he finds the perfect home? You can be sure that you'll want to write some post cards yourself after you finish Sunny's story! 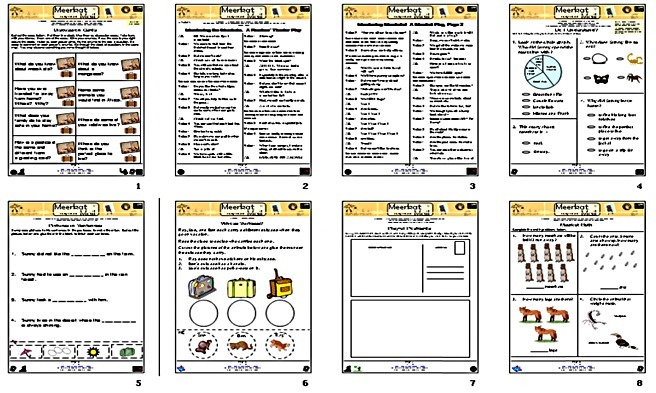 The Kids Wings 10-page activity guide for Meerkat Mail provides fun and learning, perfect for lesson planning and printed handouts or projection slides on your SmartBoard! A special thanks to the talented Mickey Gentle for his foot-stomping background music, "Walking Through the Parlor"